Beijing, sometimes romanized as Peking, is the capital of the People's Republic of China and one of the most populous cities in the world. The population as of 2013 was 21,150,000. The metropolis, located in northern China, is governed as a direct-controlled municipality under the national government, with 14 urban and suburban districts and two rural counties. 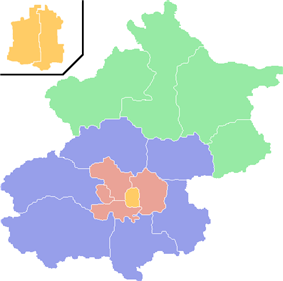 Beijing Municipality is surrounded by Hebei Province with the exception of neighboring Tianjin Municipality to the southeast. Over the past 3,000 years, the city of Beijing has had numerous other names. The name Beijing, which means "Northern Capital" (from the Chinese characters 北 for north and 京 for capital), was applied to the city in 1403 during the Ming Dynasty to distinguish the city from Nanjing (the "Southern Capital"). The English spelling is based on the pinyin romanization of the two characters as they are pronounced in Standard Mandarin. An older English spelling, Peking, is the Postal Map Romanization of the same two characters as they are pronounced in Chinese dialects spoken in the southern port towns first visited by European traders and missionaries. Those dialects preserve the Middle Chinese pronunciation of 京 as kjaeng, prior to a phonetic shift in the northern dialects to the modern pronunciation. 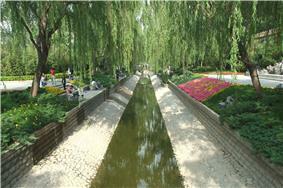 After China was reunified during the Sui Dynasty, Beijing, known as Zhuojun, became the northern terminus of the Grand Canal. Under the Tang Dynasty, Beijing as Fanyang, served as a military frontier command center. 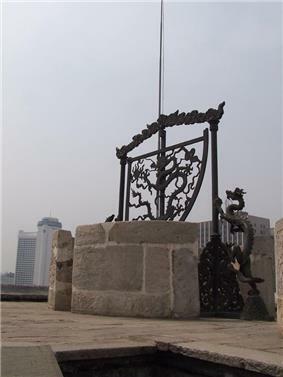 During the An-Shi Rebellion and again amidst the turmoil of the late Tang, local military commanders founded their own short-lived Yan Dynasties and called the city Yanjing, or the "Yan Capital." 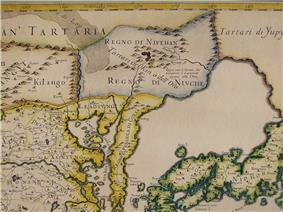 In 938, after the fall of the Tang, the Later Jin ceded the entire northern frontier to the Khitan Liao Dynasty, which renamed the city, Nanjing, or the "Southern Capital", one of four secondary capitals to complement its "Supreme Capital", Shangjing (modern Baarin Left Banner in Inner Mongolia). 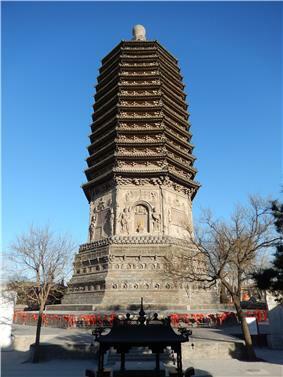 Some of the oldest surviving structures in Beijing date to the Liao period, including the Tianning Pagoda. The Liao fell to the Jurchen Jin dynasty in 1122, which gave the city to the Song Dynasty and then retook it in 1125 during its conquest of northern China. 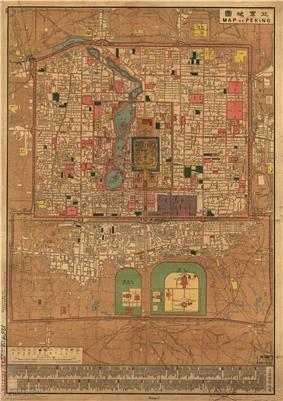 In 1153, the Jurchen Jin made Beijing their "Central Capital", called Zhongdu. The city was besieged by Genghis Khan's invading Mongolian army in 1213 and razed to the ground two years later. Two generations later, Kublai Khan ordered the construction of Dadu (or Daidu to the Mongols, commonly known as Khanbaliq), a new capital for his Yuan dynasty to be located adjacent to the Jurchen Jin ruins. The construction took from 1264 to 1293, but greatly enhanced the status of a city on the northern fringe of China proper. The city was centered on the Drum Tower slightly to the north of modern Beijing and stretched from the present-day Chang'an Avenue to the Line 10 subway. 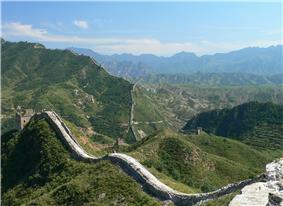 Remnants of the Yuan packed earth wall still stand and are known as the Tucheng. The capture of Beijing by Dorgon arrived 40 days later. Qing Dynasty as a direct successor of the Ming (delegitimizing Li Zicheng and his followers) and Beijing became China's sole capital. The Qing emperors made some modifications to the Imperial residence but, in large part, the Ming buildings and the general layout remained unchanged. Facilities for Manchu worship were introduced, but the Qing also continued the traditional state rituals. Signage was bilingual or Chinese. This early Qing Beijing later formed the setting for the classic Chinese novel Dream of the Red Chamber. 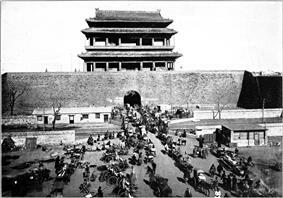 Chongwenmen, a gate to the inner walled city, c. 1906. The fomenters of the Xinhai Revolution of 1911 sought to replace Qing rule with a republic and leaders like Sun Yat-sen originally intended to return the capital to Nanjing. After the Qing general Yuan Shikai forced the abdication of the last Qing emperor and ensured the success of the revolution, the revolutionaries accepted him as president of the new Republic of China. Yuan maintained his capital at Beijing and quickly consolidated power, declaring himself emperor in 1915. 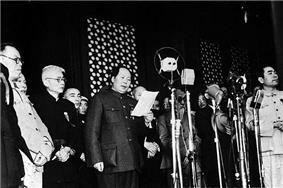 His death less than a year later left China under the control of the warlords commanding the regional armies. Following the success of the Nationalists' Northern Expedition, the capital was formally removed to Nanjing in 1928. On 28 June the same year, Beijing's name was returned to Beiping (written at the time as "Peiping"). 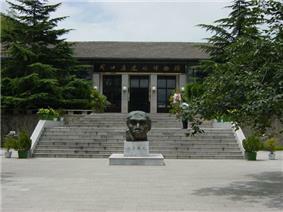 During the Wang Jingwei government based in Nanjing. Since the early 1980s, the urban area of Beijing has expanded greatly with the completion of the 2nd Ring Road in 1981 and the subsequent addition of the 3rd, 4th, 5th and 6th Ring Roads. 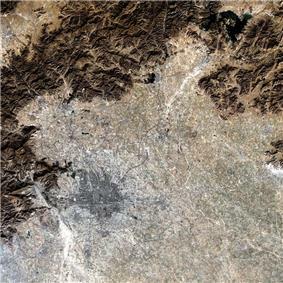 According to one 2005 newspaper report, the size of newly developed Beijing was one-and-a-half times larger than before. Wangfujing and Xidan have developed into flourishing shopping districts, while Zhongguancun has become a major center of electronics in China. In recent years, the expansion of Beijing has also brought to the forefront some problems of urbanization, such as heavy traffic, poor air quality, the loss of historic neighborhoods, and a significant influx of migrant workers from less-developed rural areas of the country. 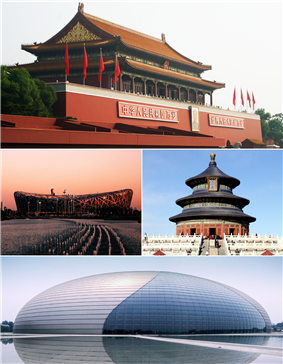 Beijing has also been the location of many significant events in recent Chinese history, principally the Tiananmen Square protests of 1989 and the 2008 Summer Olympics. 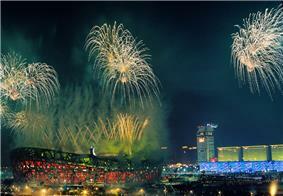 This city was awarded to host the 2015 World Championships in Athletics. Beijing has a rather dry, monsoon-influenced humid continental climate (Köppen climate classification Dwa), characterized by hot, humid summers due to the East Asian monsoon, and generally cold, windy, dry winters that reflect the influence of the vast Siberian anticyclone. Spring can bear witness to sandstorms blowing in from the Gobi Desert across the Mongolian steppe, accompanied by rapidly warming, but generally dry, conditions. Autumn, like spring, sees little rain, but is crisp and short. The monthly daily average temperature in January is −3.7 °C (25.3 °F), while in July it is 26.2 °C (79.2 °F). Precipitation averages around 570 mm (22.4 in) annually, with close to three-fourths of that total falling from June to August. With monthly percent possible sunshine ranging from 47% in July to 65% in January and February, the city receives 2,671 hours of bright sunshine annually. Extremes since 1951 have ranged from −27.4 °C (−17 °F) on 22 February 1966 to 41.9 °C (107 °F) on 24 July 1999 (unofficial record of 42.6 °C (109 °F) was set on 15 June 1942). Coal burning accounts for about 40% of the PM 2.5 in Beijing and is also the chief source of nitrogen and sulfur dioxide. Since 2012, the city has been converting coal-fired power stations to burn natural gas and aims to cap annual coal consumption at 20 million tons. In 2011, the city burned 26.3 million tons of coal, 73% of which for heating and power generation and the remainder for industry. Much of the city’s air pollutants are emitted by neighboring regions. Coal consumption in neighboring Tianjin is expected to increase from 48 to 63 million tons from 2011 to 2015. Hebei Province burned over 300 million tons of coal in 2011, more than all of Germany, of which only 30% were used for power generation and a considerable portion for steel and cement making. Power plants in the coal-mining regions of Shanxi, Inner Mongolia and Shaanxi, where coal consumption has tripled since 2000, and Shandong also contribute to air pollution in Beijing. Shandong, Shanxi, Hebei and Inner Mongolia, respectively rank from first to fourth, among Chinese provinces by coal consumption. According to Beijing's mayor the intention is to cut coal burning in the city and the surrounding areas by 2.6 million tonnes in three years by 2017. Beijing air quality is often poor, especially in winter. Many people wear face masks. In mid-January 2013, Beijing's air quality was measured on top of the city's American embassy at a PM2.5 density of 755 micrograms per cubic meter, which went off the U.S. Environmental Protection Agency's air quality index. It was widely reported, originally though a Twitter account, that the category was "crazy bad". This was later changed to "beyond index". Due to Beijing's high-level of air pollution, there are various readings by different sources on the subject. Daily pollution readings at 27 monitoring stations around the city are reported on the website of the Beijing Environmental Protection Bureau (BJEPB). The American Embassy of Beijing also reports hourly fine particulate (PM2.5) and ozone levels on Twitter. Although the BJEPB and US Embassy measure different pollutants according to different criteria the media has noted that pollution levels and the impact to human health reported by the BJEPB are often lower than that reported by the US Embassy. About 163 countries have embassies in Beijing, which are concentrated in Jiangguomenwai, Sanlitun and Liangmaqiao in Chaoyang District. Wangfujing Street is one of the busiest shopping streets in Beijing with nearly 100,000 visitors daily (August 2008). The sale of consumer goods both retail and wholesale accounted for about 1/8 of Beijing's economic output in 2013. Beijing's economy ranks among the most developed and prosperous in China. In 2013, the municipality's nominal gross domestic product (GDP) was CN￥1.95 trillion (US$314 billion), about 3.43% of the country's total output, and ranked 13th among province-level administrative units. Per capita GDP, at CN￥93,213 (US$15,051) in nominal terms and Int$21,948 at purchasing power parity, was 2.2 times the national average and ranked second among province-level administrative units. The economy tripled in size from 2004 to 2012, and grew at an annual rate of 7.7% in 2013. Due to the concentration of state owned enterprises in the national capital, Beijing in 2013 had more Fortune Global 500 Company headquarters than any other city in the world. The city also ranked No. 4 in the number of billionaire residents after Moscow, New York and Hong Kong. 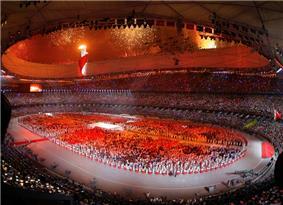 In 2012, PricewaterhouseCoopers rated Beijing's overall economic influence as No. 1 in China. 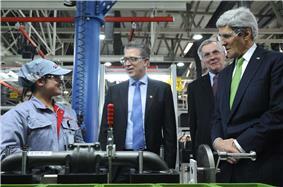 A worker speaks with a visiting dignitary at a joint-venture diesel engine factory in Beijing. The services sector is broadly diversified with financial services, wholesale and retail, information technology, commercial real estate, scientific research, and residential real estate each contributing at least 6% to the city's economy in 2013. Zhongguancun, China's silicone village in Haidian District northwest of the city, is home to both established and start-up tech companies. 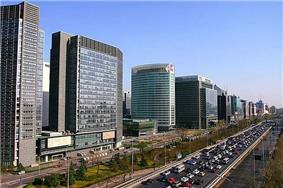 As of the second quarter of 2014, of the 9,895 companies registered in one of the six zones, 6,150 were based in Zhongguancun. 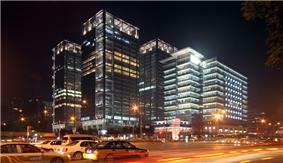 Beijing Financial Street, in Xicheng District on the west side of the city between Fuxingmen and Fuchengmen, is lined with headquarters of large state banks and insurance companies. The country's leading financial regulatory agencies including the central bank, bank regulator, securities regulator, and foreign exchange authority are all located in the neighborhood. Beijing Central Business District (CBD), is actually located to the east of the city centre, near the embassies along the eastern Third Ring Road between Jianguomenwai and Chaoyangmenwai. The CBD is home to most of the city's skyscraper office buildings. Most of the city's foreign companies and professional service firms are based in the CBD. Beijing Economic-Technologial Development Area, better known as Yizhuang, is an industrial park the straddles the southern Fifth Ring Road in Daxing District. It has attracted pharmaceutical, information technology, and materials engineering companies. Beijing Airport Economic Zone was created in 1993 and surrounds the Beijing Capital International Airport in Shunyi District northwest of the city. In additional to logistics, airline services, and trading firms, this zone is also home to Beijing's automobile assembly plants. Beijing Olympic Center Zone surrounds the Olympic Green due north of the city centre and is developing into an entertainment, sports, tourism and business convention center. In 2013, Beijing had a total population of 21.148 million within the municipality, of which 18.251 million resided in urban districts or suburban townships and 2.897 million lived in rural villages. 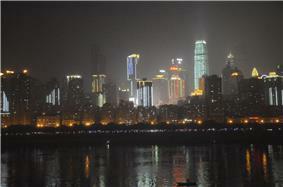 Within China, the city ranked second in urban population after Shanghai and the third in municipal population after Shanghai and Chongqing. Beijing also ranks among the most populous cities in the world, a distinction the city has held for much of the past 800 years, especially during the 15th to early 19th centuries when it was the the largest city in the world. Working age people account for nearly 80% of the population. Compared to 2004, residents age 0–14 as a proportion of the population dropped from 9.96% to 9.5% in 2013 and residents over the age of 65 declined from 11.12% to 9.2%. According to the 2010 census, nearly 96% of Beijing's population are ethnic Han Chinese. Of the 800,000 ethnic minorities living in the capital, Manchu (336,000), Hui (249,000), Korean (77,000), Mongol (37,000) and Tujia (24,000) constitute the five largest groups. In addition, there were 8,045 Hong Kong residents, 500 Macau residents, and 7,772 Taiwan residents along with 91,128 registered foreigners living in Beijing. A study by the Beijing Academy of Sciences estimates that in 2010 there were on average 200,000 foreigners living in Beijing on any given day, including students, business travelers and tourists, who are not counted as registered residents. From 2000 to 2010, the percentage of city residents with at least some college education nearly doubled from 16.8% to 31.5%. About 22.2% have some high school education and 31% had reached middle school. Three styles of architecture are predominant in urban Beijing. First, there is the traditional architecture of imperial China, perhaps best exemplified by the massive Tian'anmen (Gate of Heavenly Peace), which remains the People's Republic of China's trademark edifice, the Forbidden City, the Imperial Ancestral Temple and the Temple of Heaven. Next, there is what is sometimes referred to as the "Sino-Sov" style, with structures tending to be boxy and sometimes poorly constructed, which were built between the 1950s and the 1970s. Finally, there are much more modern architectural forms, most noticeably in the area of the Beijing CBD and Beijing Financial Street. In the early 21st century, Beijing has witnessed tremendous growth of new building constructions, exhibiting various modern styles from international designers. A mixture of both 1950s design and neofuturistic style of architecture can be seen at the 798 Art Zone, which mixes the old with the new. A Line 1 train on the Beijing Subway, which is among the longest, busiest and most affordable rapid transit systems in the world. 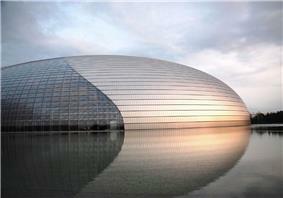 From 1 January 2013, tourists from 45 countries will be allowed to enjoy a 72-hour visa-free stay in Beijing. The 45 countries include Singapore, Japan, the United States, France, Germany, Italy, Spain, Canada, Brazil, Argentina and Australia. The programme benefits transit and business travellers. The Beijing Subway, which began operating in 1969, now has 17 lines, 227 stations, and 456 km (283 mi) of track and is the third longest subway system in the world and first in annual ridership with 3.21 billion rides delivered in 2013. With a flat fare of ¥2.00 per ride with unlimited transfers on all lines except the Airport Express, the subway is also the most affordable rapid transit in China. The subway is undergoing rapid expansion and is expected to reach 30 lines, 450 stations, 1,050 kilometres (650 mi) in length by 2020. When fully implemented, 95% residents inside the Fourth Ring Road will be able walk to a station in 15 minutes. The Beijing Suburban Railway provides commuter rail service to outlying suburbs of the municipality. There are nearly 1,000 public bus and trolleybus lines in the city, including four bus rapid transit lines. Standard bus fares are as low as ¥0.40 when purchased with the Yikatong metrocard. Metered taxi in Beijing start at ¥13 for the first 3 kilometres (1.9 mi), ¥2.3 Renminbi per additional 1 kilometre (0.62 mi) and ¥1 per ride fuel surcharge, not counting idling fees which are ¥2.3 (¥4.6 during rush hours of 7-9 am and 5-7 pm) per 5 minutes of standing or running at speeds lower than 12 kilometres per hour (7.5 mph) . Most taxis are Hyundai Elantras, Hyundai Sonatas, Peugeots, Citroëns and Volkswagen Jettas. After 15 kilometres (9.3 mi), the base fare increases by 50% (but is only applied to the portion over that distance). Different companies have special colors combinations painted on their vehicles. Usually registered taxis have yellowish brown as basic hue, with another color of Prussian blue, hunter green, white, umber, tyrian purple, rufous, or sea green. Between 11 pm and 5 am, there is also a 20% fee increase. Rides over 15 km (9 mi) and between 23:00 and 06:00 incur both charges, for a total increase of 80%. Tolls during trip should be covered by customers and the costs of trips beyond Beijing city limits should be negotiated with the driver. The cost of unregistered taxis is also subject to negotiation with the driver. 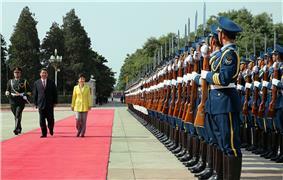 Chinese President Xi Jinping and a military honor guard welcomes South Korean president Park Geun-hye in 2013. The command headquarters of China's military forces are based in Beijing. The Ministry of National Defense, located next to the Military Museum of the Chinese People's Revolution in western Beijing. The Second Artillery Corps, which controls the country's strategic missile and nuclear weapons, has its command in Qinghe, Haidian District. The headquarters of the Beijing Military Region, one of seven nationally, is based further west in Gaojing. The Beijing Military Region oversees the Beijing Garrisons as well as the 27th, 38th and 65th Armies, which are based in Hebei. Military institutions in Beijing also include academies and thinktanks such as the PLA National Defence University and Academy of Military Science, military hospitals such as the 301, 307 and the Academy of Military Medical Sciences, and army-affiliated cultural entities such as the August 1st Film Studios and the PLA Song and Dance Troupe. The China National Space Administration, which oversees country's space program, and several space-related state owned companies such as CASTC and CASIC are all based in Beijing. The Beijing Aerospace Command and Control Center, in Hadian District tracks the country's manned and unmanned flight and other space exploration initiatives. The city flowers are the Chinese rose and chrysanthemum. The city trees are the Chinese arborvitae, an evergreen in the cypress family and the Pagoda Tree, also called the Chinese scholar tree, a deciduous tree of the Fabaceae family. The oldest scholar tree in the city was planted in what is now Beihai Park during the Tang Dynasty, 1,300 years ago. ^ a b c d "Township divisions". the Official Website of the Beijing Government. Retrieved 22 July 2009. ^ "北京市2012年国民经济和社会发展统计公报". Beijing Statistics Bureau. 7 February 2013. Retrieved 18 February 2013. ^ "2011年北京人均可支配收入3.29万 实际增长7.2%". People.com.cn. 20 January 2012. Retrieved 22 February 2012. ^ Loaned earlier via French Pékin. 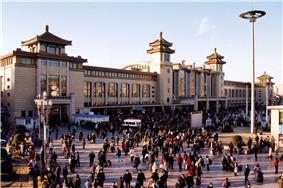 ^ "Beijing population reaches 21 million". Global Times. ^ Figures based on 2006 statistics published in 2007 National Statistical Yearbook of China and available online at 2006年中国乡村人口数 中国人口与发展研究中心. Retrieved 21 April 2009. ^ "Basic Information". Beijing Municipal Bureau of Statistics. Retrieved 9 February 2008. ^ a b c "Beijing". ^ a b "Year to date Passenger Traffic". ^ a b Hucker, Charles O. " Governmental Organization of The Ming Dynasty", p. 5–6. Harvard Journal of Asiatic Studies, Vol. 21 (Dec. 1958). Harvard-Yenching Institute. Retrieved 20 October 2012. ^ Lane Harris (2008). "A 'Lasting Boon to All': A Note on the Postal Romanization of Place Names, 1896-1949". Twentieth Century China 34 (1): 96–109. ^ Baxter, Wm. H. & Sagart, Laurent. Baxter–Sagart Old Chinese Reconstruction PDF (1.93 MB), p. 63. 2011. Retrieved 11 October 2011. ^ 元大都土城遗址公园. Tuniu.com (in 中文). Retrieved 15 June 2008. ^ "An Illustrated Survey of Dikes and Dams in Jianghan Region". ^ "Tiananmen Square". Britannica Concise Encyclopedia. 2008. ^ Robert Hymes (2000). John Stewart Bowman, ed. Columbia Chronologies of Asian History and Culture. Columbia University Press. p. 42. ^ "Renewal of Ming Dynasty City Wall". Beijing This Month. 1 February 2003. Retrieved 14 June 2008. ^ Rosenburg, Matt T. "Largest Cities Through History". ^ "Election". IOC. Archived from the original on 6 June 2008. Retrieved 15 June 2008. ^ "中国地面国际交换站气候标准值月值数据集（1971－2000年）" (in Simplified Chinese). ^ a b "Green Olympics Effort Draws UN Environment Chief to Beijing". ^ "Only 'green' vehicles permitted to enter Beijing". Autonews.gasgoo.com. 22 May 2009. Retrieved 1 June 2010. 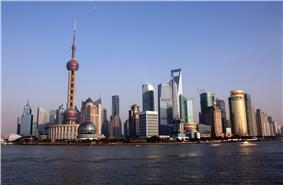 ^ "China: Beijing launches Euro 4 standards". Automotiveworld.com. 4 January 2008. Retrieved 1 June 2010. ^ a b c Mother JonesJames West, . 18 January 2013. ^ a b China Daily"Beijing to switch from coal to gas to go green". . 8 March 2012. ^ a b . 5 February 2013South China Morning PostLi Jing, "Beijing's air quality will worsen without coal control, Greenpeace says". .
^ "Beijing has worst smog in a year". ^ Demick, Barbara (2 October 2009). "Communist China celebrates 60th anniversary with instruments of war and words of peace". ^ Wong, Edward (12 January 2013). "On Scale of 0 to 500, Beijing’s Air Quality Tops ‘Crazy Bad’ at 755". The New York Times. ^ "China says it made rain to wash off sand". ^ GDP-2013 are quarterly figures according to provisional data of China NBS ( - quarterly figures (中文)National DATAChina NBS or China Statistical database - Quarterly Data (English)); the comparable data of the world economies sources materials from IMF - WEO - Database April 2014; the annual average exchange rate CN￥6.1932 to USD 1 in 2013; for purchasing power parity, CNY 4.247 is equal to intl$.1 in 2013 according to IMF - WEO - Database April 2014. ^ GDP per capita figures are according to the 2013 Statistical Communiqué of the provinces on National Economic and Social Development, The annual average exchange rate is CNY 6.1932 per US dollar; purchasing power parity (PPP) figures are according to April 2014 IMF data. CNY 4.247 is equivalent to Intl. $ 1. 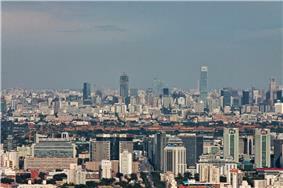 ^ "Beijing tops PwC's list of cities' economic clout". China Daily. 12 October 2012. Retrieved 13 October 2012. ^ "Capital Steel opens new branch to step up eastward relocation". ^ Spencer, Richard (18 July 2008). "Beijing abandons Mao's dream of workers' paradise". ^ "ShiJingShan". 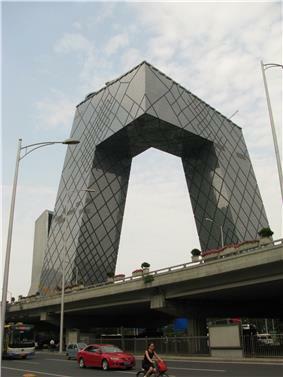 Beijing Economic Information Center. Retrieved 22 June 2008. ^ "'"Pirates weave tangled web on 'Spidey. 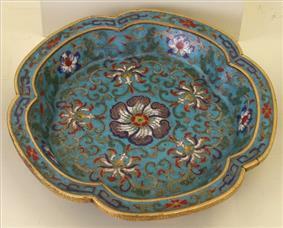 ^ "Beijing – Chinese Cloisonné Enamelware". ^ "Beijing, Places of a Lifetime". ^ "The Imperial Palace of the Ming and Qing Dynasties" (PDF). ^ Littlewood, Misty and Mark Littlewood (2008). Gateways to Beijing: a travel guide to Beijing. Armour Publishing Pte Ltd. p. 182. 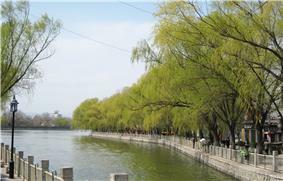 ^ "Summer Palace, an Imperial Garden in Beijing". 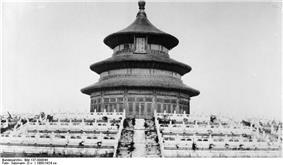 ^ "Temple of Heaven: an Imperial Sacrificial Altar in Beijing". 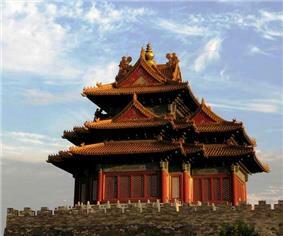 ^ "Imperial Tombs of the Ming and Qing Dynasties". ^ "Peking Man Site at Zhoukoudian". ^ Business Buide to Beijing and North-East China (2006–2007 ed.). Hong Kong: China Briefing Media. 2006. p. 108. ^ Amy Stone (Spring 2008). "Farewell to the Hutongs: Urban Development in Beijing". 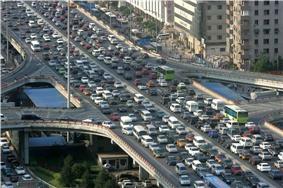 ^ "Beijingers spend lives on road as traffic congestion worsens". China Daily (Xinhua News Agency). 6 October 2003. Retrieved 22 July 2009. 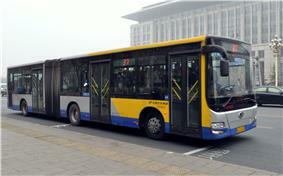 ^ "Beijing city to have five mln cars on roads by year end". Gasgoo. 12 May 2010. Retrieved 13 May 2010. 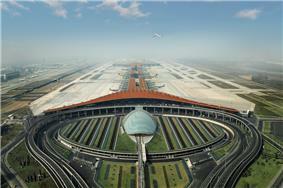 ^ "Beijing's second airport to be ready by 2017". english.eastday.com. 22 June 2011. ^ "Beijing grants three-day visa-free access". TTGmice. 6 December 2012. Retrieved 7 December 2012. ^ "30 subway lines to cover Beijing by 2020". ^ Watts, Jonathan (24 January 2010). 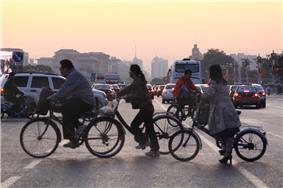 "Campaign to boost cycling in Beijing". The Guardian (UK). Retrieved 10 March 2011. Cotterell, Arthur. (2007). The Imperial Capitals of China: An Inside View of the Celestial Empire. London: Pimlico. pp. 304 pages. Elliott, Mark C. (2001). The Manchu Way: The Eight Banners and Ethnic Identity in Late Imperial China. MacKerras, Colin; Yorke, Amanda (1991). The Cambridge Handbook of Contemporary China.